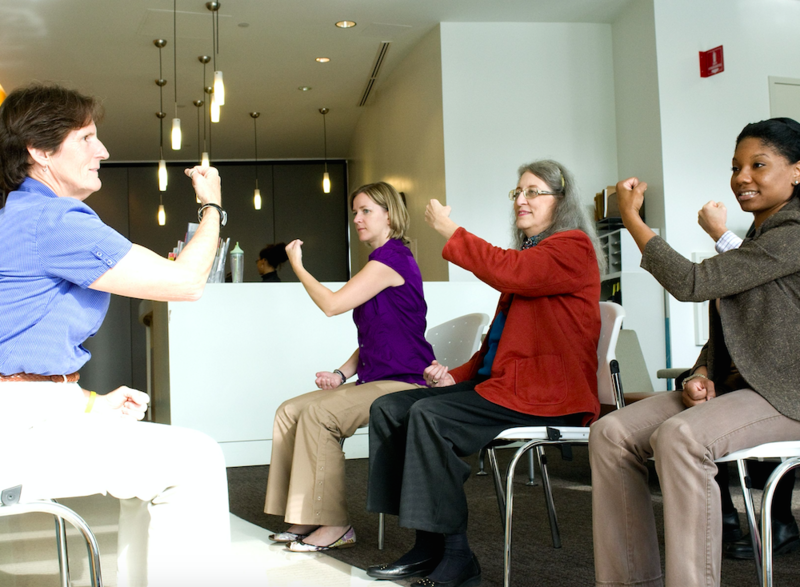 These exercises to do at work can have a huge impact on your mood and productivity. The typical office situation is sitting down at a desk for 8 hours every day, with minimal breaks or physical activities to break it up. This can negatively affect your health, but also the quality of your work and overall energy level. Sitting all day increases health risks and induces boredom. No need to run a marathon – it doesn’t take much to get major health benefits from doing basic exercises at work. 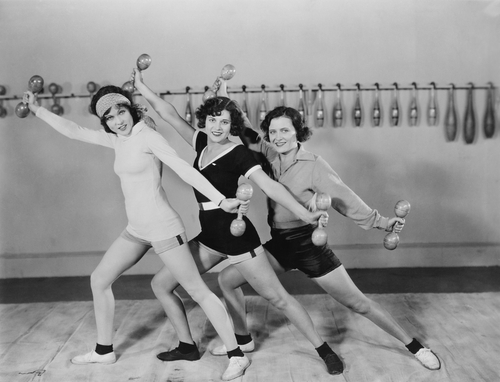 So here’s why you should start exercising at work, and what exercises to do at work! Furthermore, employees who are fit and regularly exercise are less likely to get sick. Employees who spend more time at work get more done and are more invested in what they’re doing. Exercise also releases emotional tension. It’s a great stress reliever from what happens in work and personal life. By adding in exercise wherever you can in your daily routine, you’ll experience a higher level of productivity. It may seem counterintuitive, but getting enough exercise actually increases energy and makes you feel refreshed and restored. By having more energy at work, you’ll be able to focus more on the tasks at hand. Another reason to exercise is for greater satisfaction. Employees who spend 2.5 hours a week or more on exercise are more satisfied with the outcome of their work. This, in turn, increases the ability to do a good job. Higher satisfaction also leads to a more positive attitude. An employee with a mental and physical balance has a more positive point of view and is a better member of your office community. You understand the importance of doing exercises at work, but may not know where to start. Here are some easy exercises to do at work, none requiring equipment or a personal trainer! Stair exercise: Ditch the elevators and taking the stairs to your floor for a great cardio exercise. Jog in place: If you’ve been slogging away for hours, then a short break. Take a moment to re-energize your muscles. Stand up from your chair and begin jogging in place! Walking: Good exercise, but totally underrated. Get up and stretch your legs – around the office, visit a coworker on another floor, or take a walk around the block. Standing: Standing can help reduce some of the negative health effects of sitting. It’s not a huge calorie burner, but it breaks up the monotony. If you find that you’ve been sitting for a few hours, make sure to at least stand-up and stretch your legs. Paper pushups/incline pushups: Put both your hands on your desk, and walk your feet back to form a 45-degree angle and start doing pushups. This exercise is good for strengthening arms! Book press: Get the heaviest book on your desk. Hold it back behind your head. Extend your arms up and back down, then repeat the process. This exercise is great for your triceps. Shoulder blade squeeze: Squeeze your shoulders backwards and hold it for 10 seconds. Release then repeat. This will improve the hunched posture associated with sitting for so long. Chair squat: Stretch both arms in front of you. Stand up and sit back to your chair, and repeat. This will help with toning buttocks. Wall sit: Position on a wall, squat down up to 90-degree angle, then slide back up. Repeat. This exercise is great for toning your thighs. Leg stretch: On your chair, straighten your leg and hold it for 10 seconds. Put it back and do it on the other leg. Repeat the process. This exercise is good for abs and releasing cramps. If you want to be more productive and energetic at your work, start moving the muscles in your body. Try these simple exercises, and see how it will benefit you and your workplace lifestyle. Are there any exercises at work you’d add to this list? We’d love to hear your thoughts and expertise in the comments!